From the time I was a young boy, the Constitution and the principles of freedom fascinated me. Looking back, something was placed on my heart and mobilized me towards freedom. I always wanted to do something that would allow me to advocate at a high level on a full time basis. It is my calling. I went to law school and practiced law for more than a decade thinking that this was the “full-time” journey I was looking forward. My experience there keep me on the hunt. 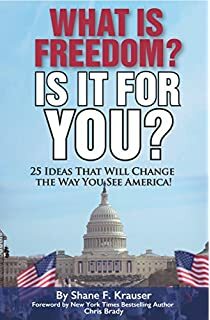 In 2014, I adopted a platform that allowed me to address the issue of money and, at the same time, move the message of more freedom and less government. We need more freedom advocates. Part time advocates will never accomplish anything remotely close to what the founders experienced. This is my story to making this happen. Without question, the head of the snake is found in our financial system. If the masses truly understood what was going on here, there is no doubt in my mind we would be rioting in the streets. Control the money and you control all of the issues. I was in the crowd and heard this speech live given by Orrin Woodward, and it is the best rendition of what the greatest problem we are dealing with in the United States and throughout the world. Fiat currency, the manipulation of the money supply, fractional reserve banking – The Federal Reserve. This is the system that is enslaving the masses, knowingly or unknowingly. I had an experience recently that provided some serious perspective for me. It involved a great conversation, an NFL football player, and chickens. Take a look!